This is a collection of sample questions published prior to the 2010 revision to introduce revision details. It covers all forms of test item types for all levels (the number of questions is different from the number of test items in an actual test). In the Listening section, one sample question with an audio file is offered for each test item type. 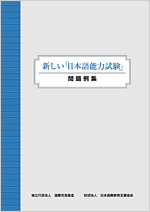 A book combining "New Japanese-Language Proficiency Test Guidebook Executive Summary" and "New Japanese-Language Proficiency Test Sample Questions" with an audio CD of listening questions is available from Bonjinsha. Click here for details. (* 1) Number of questions in actual test will differ. (* 2) For some questions only. (* 3) Audio is played in actual test. Each test item has "directions" that specify how to answer the question. In order to make it more convenient for examinees, some changes in directions have been made since the "New Japanese-Language Proficiency Test Sample Questions" was published in August 2009. Test items whose directions have changed are summarized by level for your review.